Selecting the best Husky food can really make a difference in your dog’s wellbeing and even appearance. Many Huskies are picky eaters or may have sensitivities to some of the ingredients found in commercial foods that are commonly known to cause problems for some dogs. Therefore it’s important that you pick a food that works best for your Husky’s needs. Fortunately, there are many options available for Husky food. You should also note that Huskies do not need to eat as much food per pound of body weight than other dogs of the same size. They have become adapted to processing food very efficiently and are able to get more nutrients out of their food than other breeds. Following the feeding guidelines on dog food labels would probably amount to too much food for your Husky, so be aware of that. When it comes to selecting a Husky food, you will first want to decide on the type of food to feed. Most owners feed either kibble or a raw diet. A combination of both can be fed as well. No matter which food you decide to feed, there are some considerations to take note of for both types. It’s also important to keep in mind that there is no such thing as “the best food.” The best food to feed your Husky is the one that works best for him. I have heard of dogs that have problems with kibble, but do great on raw, and also the reverse. Since every Husky is different, it may take some experimenting to see which type of food your Husky really thrives on. Kibble is a complete food that comes in a dry pellet form. When selecting a kibble, you should always look at the ingredients and labels. Always shop for kibble at a pet store or better yet, a pet food supply store as they usually carry the better quality brands. Kibble sold at grocery stores are usually of poor quality and rarely anything that should be fed to your Husky. Also be aware of some of the ingredients that commonly cause sensitivities in many dogs, such as grains. Some filler ingredients that you should definitely avoid are corn and meat by-products. You may have to switch through different brands a few times to find a food that works well for your Husky. Many owners also choose to feed the raw diet, also known as the BARF (Bones and Raw Food) diet and report improvements in their Husky’s health and even appearance. Fewer visits to the vet are also reported. Huskies fed on a raw diet also seem to be less prone to nutritional deficiencies, which is an important factor to note, because ZRD (Zinc Responsive Dermatosis) is commonly seen in the breed. Getting started with feeding the raw diet is not difficult. There are several resources out there that provide excellent guidelines on how to feed a proper balanced raw diet. A great one to get started with is Delicious Dog Diet. It includes details on how to begin with the diet or switch over to it with a step by step process, as well as information on exactly what you need to do to do raw feeding correctly. 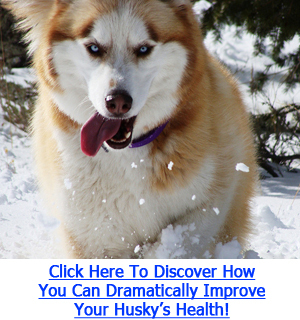 Click Here If You Want To Have Your Husky Living AT LEAST 5 Years Longer! Table scraps should also not be fed in large amounts or even better, not at all, as they will throw off the nutritional balance of your Husky’s diet and will decrease his appetite come feeding time.